This Grand looking G seems to be gorging some grapes! Please download for free as per normal, by clicking on it. Below I am practicing how to load up a shop and give people promotion codes! When I have the routine sorted, I will look at how to get it working on wildersoul.com. Fun and games! Standard size (660px x 540px) with Wildersoul borders as above. Enjoy your test-drive of my Sellbox! Vvrrrrrrroooooooooooooooommmm! Coming soon! 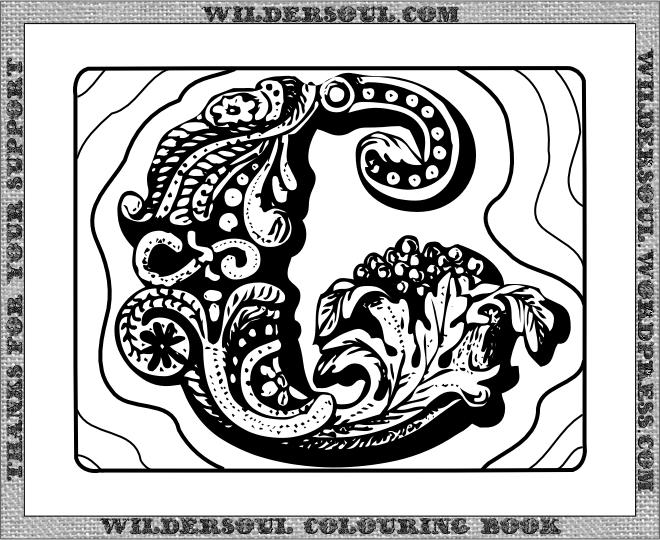 In the meantime, please enjoy choosing from the 365+ colouring pics available right now for free download and print, right here on the blog. You’re already a “Gold member” in my heart. Happy colouring, or poem-creating! What begins with G?